Are you looking for a TOTAL vacation-for-rent-package? This secluded hiking, fishing, outdoor mountain lake rental has it ALL. Start with a pristine private lake, and a secluded outdoor mount-type hiking park in North West Arkansas. Make sure it's just a scenic drive from Branson and Silver Dollar City, Missouri. and go four wheeling all day! to go 4wheeling at once. 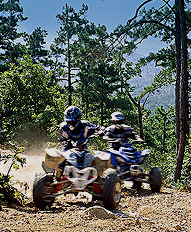 This is one of the most private places to ride atvs anywhere in the AR or MO Ozarks. Huge scenic bluffs invite you to explore this special corner of the famous Buffalo River country. One of a kind vacation-for-rent outdoor lake beats the socks off the crowded Table Lake area around the Branson hills and Branson lakes. In every direction around the Lake House rental cabin, secluded wilderness sights and sounds await you. 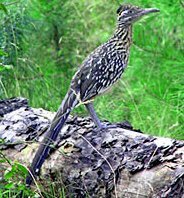 Birdwatching and wildlife viewing are natural highlights of your family vacation or group retreat here. Early morning or late evening walks around the lakeshore bring lots of opportunities for special memories. If you like hiking Arkansas forests and outdoor ridge hikes, you'll love waking up here. Not far from the Lake House vacation rental cabin, you'll find ancient rock drawings and rock painting left here by Native American Indians. Ancient Native Americans inhabited this area hundreds of years ago. Every Spring, after winter rains, folks find lots of arrowheads and other really old Indian artifacts all around SnowBall and Marshall Arkansas. Your family can catch the spirit of the ancient Ozark bluff dwellers' history just a few steps away from your cabin and it's beautiful fishing lake. Our thanks to the Arkansas Tourism Department for atv kids photo and to Arkansas Game & Fish Commission for AR bird photo.